We can’t automatically detect your promo code if you use an ad blocker. You can either manually enter the code, or disable your ad blocker and reload the page (we promise not to spam you with ads). Rate is $ base fee plus $ per minute. The minimum charge is $. The clock starts when loading starts and stops when unloading is complete. The price estimate assumes between - minutes of loading/unloading time + drive time from pickup to drop-off. Price includes $20,000 in cargo insurance. Price estimate may vary based on actual loading/unloading time and traffic. Customer is responsible for all tolls/dumping fees. If you cancel your Project, then GoShare will charge you $10 per Delivery Pro. Regarding assembly. Furniture assembly only, no appliance installation. 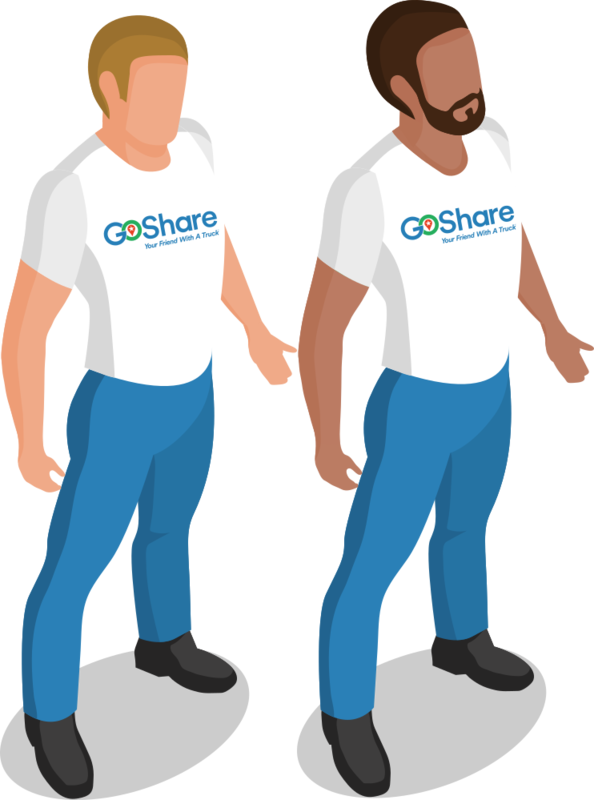 GoShare does not support assembly services for cribs, gazebos, outdoor play structures, bunk beds, hot tubs and pool tables. All fees are non-refundable. Thanks for completing your order! We're sending your request to our fleet of GoShare Delivery Pros. You will be notified when someone accepts via email. Download the app for best experience and real time push notifications or visit your order history for updates. Redirecting to dashboard in . Addresses entered are outside our service area. Enter your name and email to receive a promo code when we launch in your city. Rates are higher than usual in order to balance supply with increased customers demand. Per minute rate is increased by %.